Purenviro supplies efficient scrubbers for odor and gas purification. 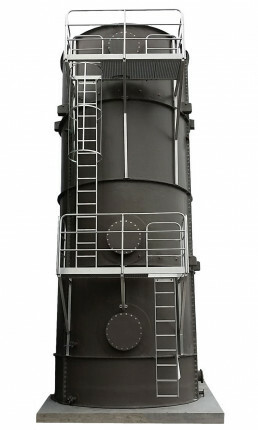 Scrubbers are probably the most frequently used technique to purify air and gas. 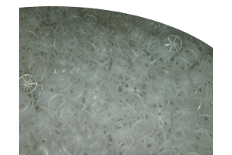 They are also called gas washers, absorbers, and wet scrubbers. The working principle is simple, yet there are many alternative configurations. Below is an overview of some of the scrubbers offered by Purenviro. How does a scrubber work? A scrubber cleans the air and gas by washing with a liquid. They can be constructed as both horizontal and vertical towers. Vertical towers are more common. 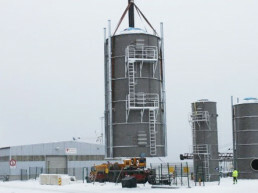 In such towers, the contaminated gas enters the bottom part of the tower and flows upwards. Washing liquid enters at the top of the tower and flows downwards. Tower internals ensure optimal contact between gas and liquid. Depending on the chemistry, the liquid may be pure water or water with added chemicals, and it may be used several times before purged. When should you choose a scrubber? Scrubbers are listed as BAT (Best Available Technique) in most sectors. You should choose a scrubber when the air flow is large. Some contaminants are particularly easy to remove in scrubbers. Most common applications include hydrogen sulphide, H2S, amines, RNH, volatile acids, VFA, og sulphur dioxide, SO2. Furthermore, scrubbers are very suitable for odor abatement. Scrubbers are widely used in a range of different industries. There are many process configurations ans options. They can be adapted to a large extent to the individual applications. Below are some typical applications. Scrubbers are very well suited for odor reduction in off-gas from aquatic feed production. We achieve 95-98% removal rates with minimal liquid and energy and small footprints. Scrubbers are the preferred solution with many of the key players in the aquatic feed market. Combustion gasses often contains SO2 which can be removed efficiently and at low cost in scrubbers. If available, sea water can be used, otherwise alkaline scrubbers are preferred. Odor from sewage treatment is often treated in scrubbers. Especially the large air flows from sludge processing and also the off-gas from the digesters can be treated in the scrubbers. Ammonia is used as a refrigerant in large cooling applications. Uncontrolled spills and emissions can put people’s lives at risk. Furthermore, at high concentrations the ammonia is flammable and can cause explosions. Properly designed scrubbers are very suitable as safety devices in emergency ventilation systems. Odor emissions from fish oil and meal production can be efficiently abated with sea water scrubbers. Our optimal design offers up to 99% efficiency. Biogas may contain H2S at levels that can be a risk both for personnel and equipment. Alkaline scrubbers are very efficient in removing H2S also in areas rated as Ex / Atex. Acid gasses like hydrochloric acid, HCl and hydrofluoric acid, HF, can be treated with high efficiency in scrubbers. These gasses are often emitted from metallurgic industry, solar panel industry, and electronics industries. We manufacture scrubbers in several different materials. What is optimal in one application may not suit the next one. Our experience helps us making in the correct and optimal choices. Scrubbers manufactured in fiber reinforced plastics are protected against corrosion and exhibit high mechanical strength. By choosing the correct matrix materials and a layered construction, we are able to offer good chemical resistance and tolerance to high temperatures. Scrubbers in PP have superior chemical resistance and no problems with corrosion. PP is the optimal choice when the chemistry is very aggressive. Purenviro combines PP with steel reinforcement, making PP constructions with unsurpassed strength. Scrubbers made of steel have the highest strength and best tolerance to heat. Corrosion can be avoided by choosing the correct steel grade. Purenviro offers towers in different stainless steel and duplex grades such as 1.4404, 1.4436 and 1.4462. 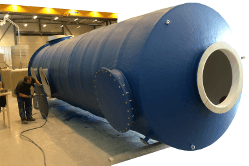 Scrubbers with diameter up to 2500mm can be supplied by truck.Large scrubbers are delivered whole by boat or in parts and assembled on site, all depending on location. Scrubbers can be supplied for manual or for fully automatic operation. 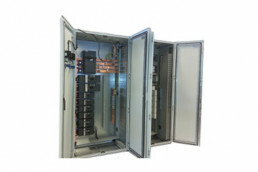 When automatic systems are preferred, Purenvro offers complete control cabinet and field sensors. 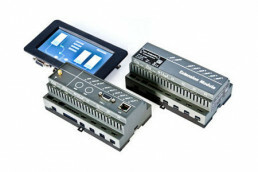 We have developed software for process control, and we offer remote monitoring and reports on the web, as well as full integration with local SCADA. Purenviro offers all types of tower internals and spare parts. 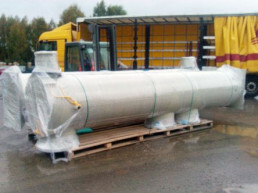 Distributors suitable for large scrubbers, especially in systems where there is a risk for precipitation and impurities. It offers very high efficiencies. Ladder liquid distributors are suitable for small scrubbers where the liquid system is free from impurities. Support mesh is used to retain the scrubber packing. 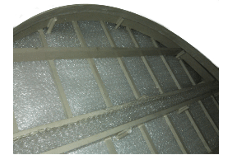 Our mesh can support up to 2500 kg/m2. 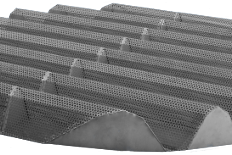 Corrugated support plates in steel offers superior performance, low pressure drop and high strength. We produce these in stainless steel and duplex. Mist eliminators are essential, especially in chemical scrubbers. We offer mist eliminators with 99.9% efficiency. The scrubber packing is the key component of a tower. 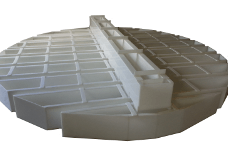 We offer a wide range of packing and can provide advance on the optimal design.